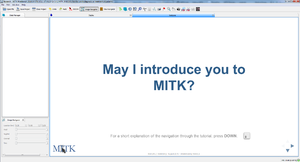 The Welcome page of the MITK Workbench includes a tutorial slide show that explains the MITK Workbench basics. The registration plugin has been retired from the binary release due to some usability issues. It will be completely replaced with a better alternative in the near future. The image type of newly created segmentations is mitk::LabelSetImage, which is bundled with its own reader and writer based on the NRRD image format. You are still able to save segmentation images as binary NRRD images, though. We are working on the migration of MITK to some up-to-date third-party toolkit versions, in particular ITK 4.9, VTK 7, and Qt 5.6. As Qt 5.6 is the first LTS release since Qt 4.8 and has breaking changes compared to Qt 5.5, we will require Qt 5.6 as minimal required version. Qt 5.6 is not yet supported, though. We will drop MSVC 2012 support. The manual registration plugin will be replaced with a better alternative. The image cropper plugin will be completely rewritten for better usability. The segmentation plugin will be rewritten for full multi-label support. In the 7 months since the last release 180 bugs were fixed. This page was last modified on 24 April 2016, at 08:57.